We arrived in Rome at about 9am local time, and we had just enough time to drop off our bags at our rental apartment and crossed one of the many bridges over the Tiber River and into Vatican City. 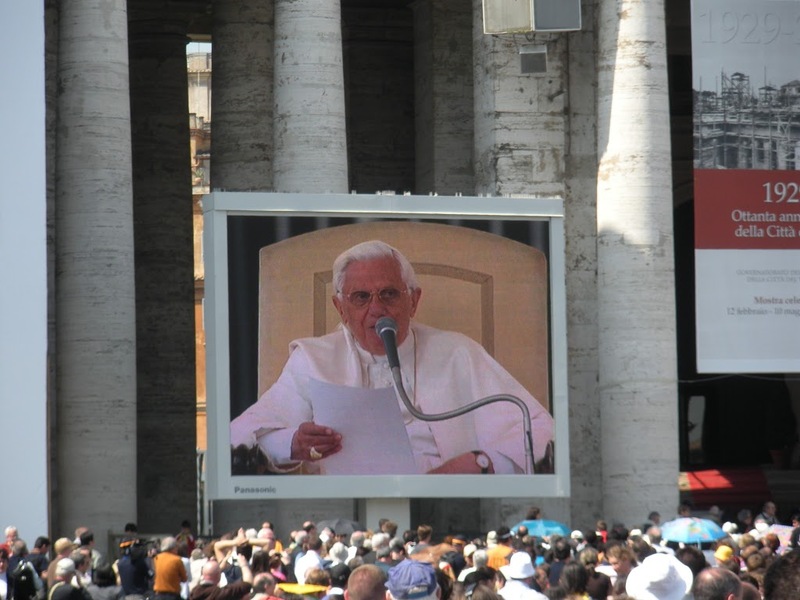 Lo and behold, Pope Benedict was there giving a public address in St. Peter’s Square. My favorite part of St. Peter’s was the duomo. Our tour guides told me that you can stand two Statues of Liberty on top of each other and fit them under the dome. Also…I learned that the tiny little letters inside the gold ring are 10 feet in height, whereas the ones on the outer ring are six feet in height. Goes to show you how high this duomo actually is. Absolutely breathtaking! These were in bloom everywhere in Venice! When we went to Venice, we took a small water taxi over to Murano Island. That’s where the famed mouth-blow glass is made. I was so smitten by these hand-painted little goldfish inside glass that an employee gave me one. The ruins of Pompeii were out of this world. There was still black ash blowing around, even after all these centuries after the devastating eruption of Mt. Vesuvius. Can you believe these murals? My husband had a little too much fun in the ruins of Pompeii. I don’t even know if this was allowed. The Trevi Fountain was one of my favorite spots of Rome. The golden doors of the Baptistery in Florence were pieces of art I studied in AP Art History. I came to find out only recently that these are replicas, as the originals were undergoing extensive restoration. Last but not least, my favorite place of all in Italy: Cinque Terre. We stayed in Monterosso al Mare. The waters of the Italian Riviera were just breath taking! I hope you enjoyed this little taste of Italy. I felt like I was at home there. I will share more of our treasures of each city in the weeks to come! Beautiful pics, especially that last one of the Italian Riviera. I definitely need to go to Italy sometime soon! The art history nerd in me would have been DEVASTATED to find out they were replicas! Gorgeous, gorgeous trip! Aww what a beautiful honey moon. Happy Belated anniversary. I am hoping to go there for our 10th anniversary in 2 years well there and INDIA. Hubby told me to choose one so it’ll likely be India if he doesn’t cave. Italy is my dream vacation so I love living vicariously through other people’s trips! Amazing photos! How long were you there? I am sure you didn’t want to leave. This makes me want to go Italy even more than I already did :) Beautiful pictures! Sounds like a great honeymoon. We went to the Outer Banks, haha. how beautiful! I hope we get to visit Italy one day! It’s on my wish list! Do share more :) Great photos from your trip. i would love to go back some day. Thanks for sharing! Wow — beautiful pictures! Italy is definitely on my list of places to visit! love your photos! i went to italy awhile ago and loved seeing all the murano glass too. so beautiful! It looks beautiful there!! So break taking!! I hope you are having the most amazing time– love your pictures! Beautiful pictures! My husband and I went to Italy a few years ago and I loved it. We were in Sicily most of the time we were there and it was an amazing experience. We went to Italy three years ago and I have pictures very much like yours. We didn’t make it to Venice, but we went to Rome, Florence and Cinque Terre. We stayed in a villa outside of Lucca, which is also a beautiful area (as if any area in Italy ISN’T beautiful! ).